I'd like an entendre. And make it a double. I'm pretty much anti-fast-food-restaurant. And not just because of the lack of nutritional value, the trying-to-hook-future-customers-by-marketing-to-kids or even that "burgers" are really a euphemism for "extruded pink slime." 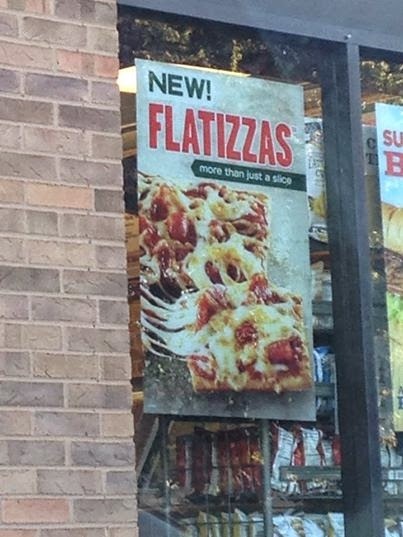 When I posted this abomination on Facebook, my outrage was shared by many like-minded friends, one of whom provided this link to a Jezebel article, which perfectly captured the reasons for my hostility toward the Flatizza. ...until I realized that the healthy items were included in a pull-out menu of their own and that each healthy item was referred to as "Skinnylicious." Meaning that even though I really wanted a salad, I was not about to order the "Skinnylicious California salad." Posts that are like children to me....or at least stepchildren. What Is...Roughin' Up The Suspect? Laser? I Just Met Her. I'll Probably Blow The Whole Illusion By Referring To Them As "Crescents"
I would buy these bloggers a beer. Metaphorically. I'm not made of money, you know.